By Anthony James West — A Shakespearean scholar investigates a centuries-old enigma. By Joel Silver — A look back at Jake Chernofsky and the magazine that defined bookselling for two generations. By Nicholas Basbanes — The Known Book World. By Joel Silver — Solving the collational formula. Armed Services Editions return; the tsunami; delaminating Jefferson; and more. Fine Pick: Sci-fi covers in Worlds of Tomorrow; plus Essays on Books and Bibliophiles. 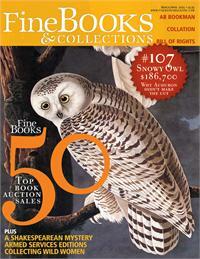 By Ian McKay — Highlights of book auctions worldwide.